I want to share a really inspiring video with you. But first, let me give you a little background on this incredible story. I’ve known Case McCoy almost all his life. This is his Senior year as the quarterback for the University of Texas Longhorns and he’s leading his team to the Alamo Bowl against Oregon on December 30th. 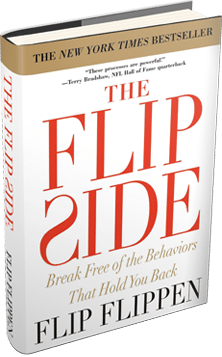 His father, Brad McCoy, is a Senior Consultant and sought after keynote speaker at the Flippen Group. In this video, I want you to see what his family is about, what they’ve dealt with, what’s made them who they are and, ultimately, what’s helped form Case into who he is today. Then, I want you to take this powerful message to heart as a leader. The specific thing to notice about Case’s story is how a family pulls together to support somebody when they are going through or experiencing a difficult time. You see, sometimes, you can fix things and other times you have to adjust to things. At 4 years old, Case was diagnosed with a form of scleroderma, a disease that involves the hardening of skin and the tightening of connective tissues. The type of scleroderma he was facing, morphea, is usually found in adults – not pediatric patients. Case went from healthy to not-so-healthy overnight. After many years, he was able to get his illness under control and during that time Case had to learn how to build his life in spite of it. Here’s what I mean…most of us have hardships, but often, we just want to make the difficulties in our life go away. But, many times we have to work through those challenges, not just make them go away. Our hardships end up making us more – not less. Scleroderma is a hardening of tissue. It can occur internally or externally. If it’s internal, it generally kills you. If it’s external, it can disfigure you. In Case’s situation, I want you to notice the one thing that he did not do. He didn’t let the hardening of the tissue change the softness of his heart. I see a lot of people going through difficult circumstances and they allow those circumstances to harden their hearts. Will you take a cue from my friend, Case, and keep your challenges from taking over your heart? If you can do that, you’ll be more – not less. Click below to watch Case’s story.